Nihan Deniz at Aegean Yacht confirms price cuts on two central listings, the 23.9m motorsailor Diva and the 28m new build motor yacht Aegean 28. 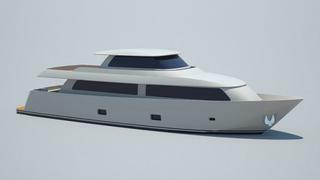 The Aegean 28 is currently under construction at Aegean Yacht in Turkey with delivery scheduled for March 2012. This superyacht has a steel hull & superstructure with teak laid decks. The power is from two 700hp Yanmar engines which will allow the Aegean 28 to manage a maximum speed of 16 knots. Thanks to efficient fuel consumption and a 14,000 litres fuel capacity, the maximum range of the Aegean 28 will be 1200 nautical miles. The interior can accommodate up to 10 guests in five en-suite cabins with additional space for six crew. The owner’s suite is situated on the main deck, with two identical double and two twin bedded guest cabins. Previously asking €2.9 million, she's now down to €2.2 million. Diva is a large and comfortable yacht, with two masts and a Bermuda rig. She has ample deck space, including a large cockpit/aft deck area, with a dining area and sunbathing platform as well as a steering console. Unusually for a sailing yacht, she has spacious interiors, with the main saloon protruding above deck to gain maximum space and sunlight. The main saloon has a dining table for 12, with a spacious and comfortable seating area. There is a master cabin and two double guest cabins to the yacht’s aft, while two further triple guest cabins are located at the bow. This luxury sailing yacht also includes a captain’s cabin and a triple crew cabin. Diva has had a price cut from €1.4 million to €1.2 million.